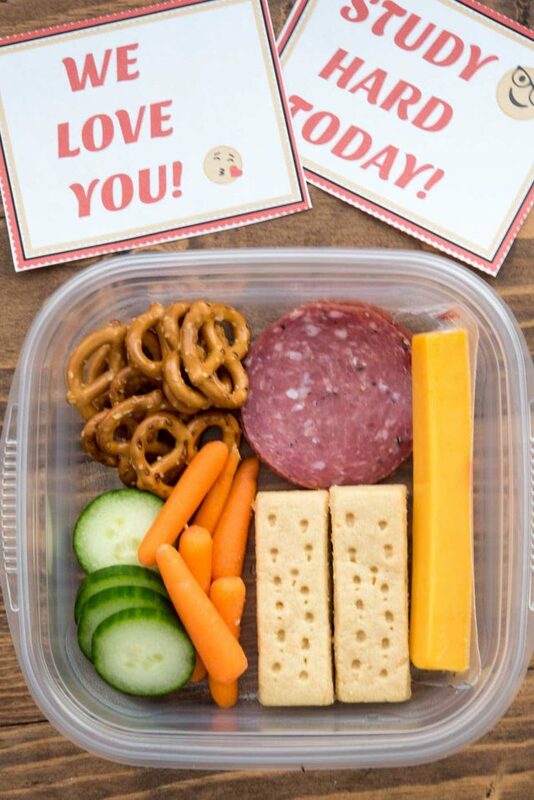 Emoji Lunchbox Notes are the cutest free printable notes ever! Your kids will love them, along with these easy lunch ideas for back to school. Back to school is in full swing here, how about with you? I think there are still a few schools that don’t start until close to (or after) Labor Day but we started two weeks ago! I’ve been dutifully packing Jordan’s lunch each day and it’s getting harder and harder to find things she likes. She’s picky when it comes to lunch so I end up with the regular old things like salami or turkey or peanut butter, but I’m constantly trying to find new extras to go along with them. From veggies to fruit to snacks and treats, I like to vary her lunches each day so she doesn’t get too bored. Besides just food in her lunch, when I remember I like to add a little fun note or joke for her. I know that she’s all cool and stuff now that she’s in middle school, but she’s still my kid and I like surprising her with a note once in awhile. Even if she’s embarrassed by it, I think a little part of her appreciates the little hello from me during the day. Sometimes, if I’m in a rush, I just jot down an “I love you” on a post it note. Other days, when I’m feeling like I have more time, I print up little fun jokes or printables for her. 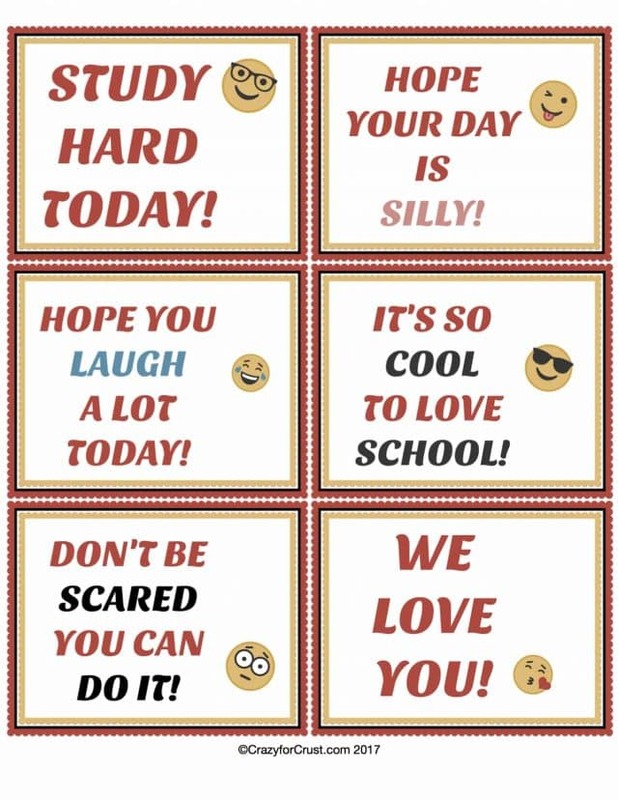 This free printable is one I made a few weeks ago to start off her school year right. She is obsessed with emojis right now (I mean, who isn’t?) so I incorporated her favorite emojis into some fun lunchbox notes. And now you can use them too! 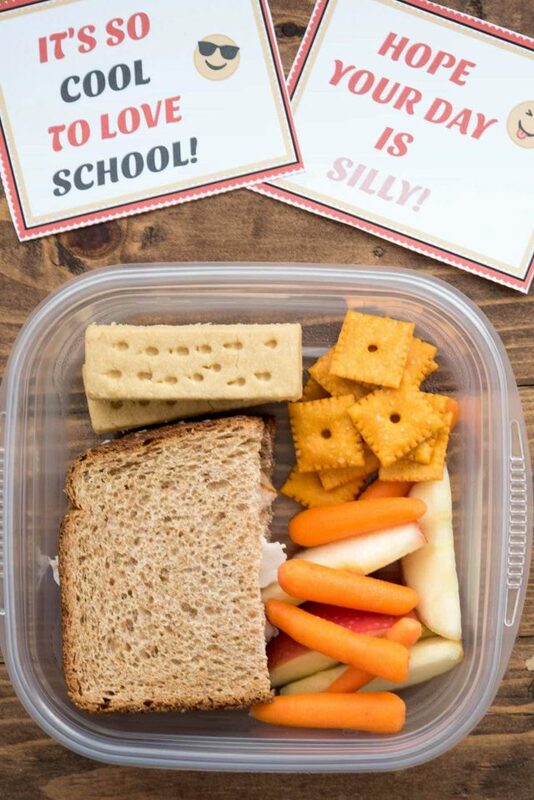 Emoji Lunchbox Notes will make your kid smile when they see the free printable in their lunch at school! Get the FREE PRINTABLE Emoji Lunchbox Notes HERE. Besides just notes, I have to make lunches too. If only a note were all I needed to send! Here are a couple of ideas for easy lunchbox recipes that Jordan loves and will eat! If you have a picky eater these ideas are for you. Jordan always gets a protein or two, some fruit and vegetables and a small treat in her lunch. One of my favorite treats to send with her are Walkers Shortbread. She loves their shortbread and they fit easily into her lunchbox. Lunch #1: Salami and a cheese stick, carrots and cucumber slices, pretzels and Walkers Shortbread Fingers. Lunch #2: Turkey sandwich on wheat, carrots and apples, cheese crackers, and Wakers Shortbread Fingers. 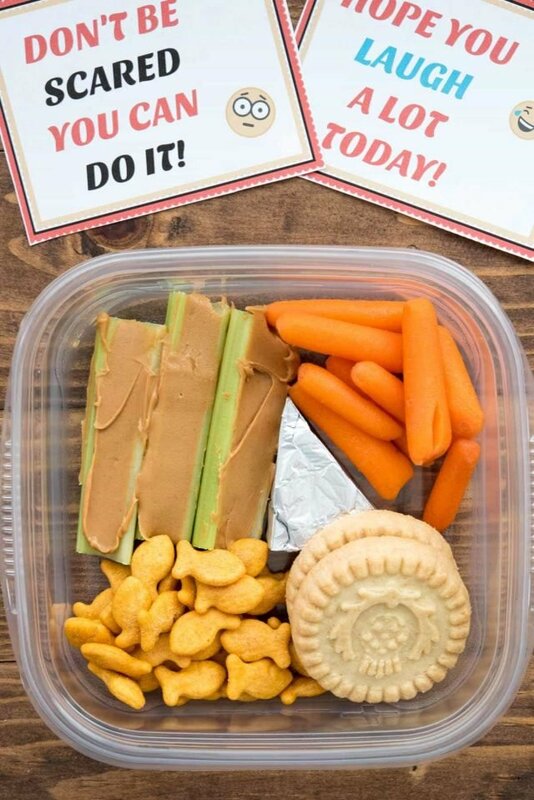 Lunch #3 (this is also a great after school snack): Peanut butter on celery, soft cheese with cheese crackers for dipping, carrots, and Walkers Shortbread Rounds. Add some fruit and/or vegetables. Add a little treat like Walkers Shortbread Cookies! 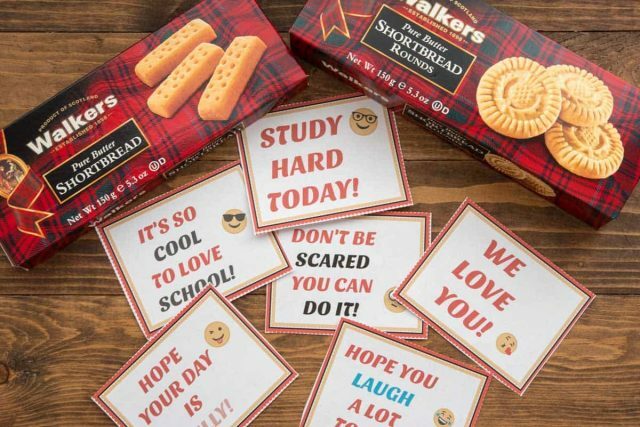 Don’t forget the emoji lunchbox note! Cute idea Dorothy! LOVE free printables and Walker’s Shortbread! Cute lunchbox photos! I can always use more ideas for my picky eater! Cute idea. And of course great treats (Walker’s Shortbread)! Totally gonna copy! Super cute and colorful lunch ideas!